We've had a few extremely busy weeks and I feel like a broken record repeating it, but it really has been a wild ride here. Between senior proms, my surgery, soccer tryouts and various other functions, it seems almost impossible to find any time in the kitchen, nonetheless take pictures or write something. I might as well apologize already in advance, because until the middle of June I don't see it getting any better. To get back to the Proms though, both of them were a rousing success. She looked beautiful to her father and I (and we might be a tiny bit biased on this) and made us both choke up when we realized that our little girl is not so little anymore. The second prom which she attended with her best friend really hit us hard, they all looked so grown up and the little twinge I've been getting in my stomach about her leaving us soon hasn't let up and reality is starting to set in more with each day. Either way, I promised you all a picture, so here it is. 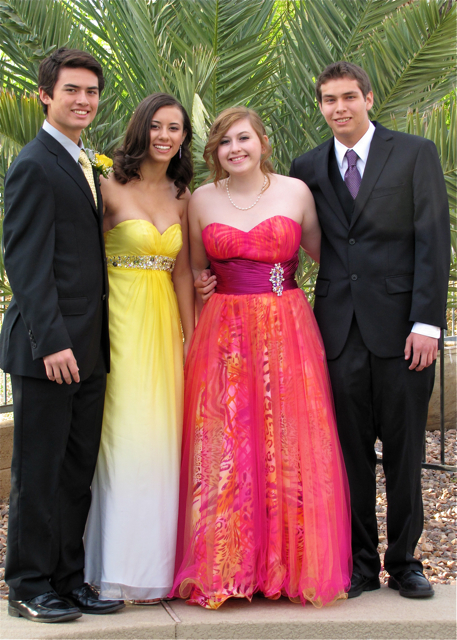 Our daughter is the one in the pink dress which fit her personality perfectly and the girl in the yellow is her best friend. The second thing on my agenda today is to let you all know that I'm participating in an online bake-sale that Becky from "Baking and Cooking, A Tale of Two Loves" is hosting on May 2nd. The bake-sale is going to be in the format of a silent auction and you can bid on some great goodies. Becky is hoping to raise money for a very worthy cause: Relay for Life, that will benefit the American Cancer Society and which she is also participating in. My contribution for this auction will be my Nutella Chocolate Cookies. The highest bidder will be able to pick their choice of bittersweet, semisweet, milk chocolate or white chocolate chips to customize the cookies to their taste. I hope you'll hop on over and check out all of the goodies up for auction and support a great cause that is very near and dear to my heart as well. My own daughter is actually participating in one of the Relay's for Life in our home state and will be walking in honor of her Opa, my dad, who passed away from cancer a few years ago. Trying to bring this hodge podge of a blog post back to food isn't going to be very easy or eloquently, but here it goes, just pretend I'm doing a fine job. 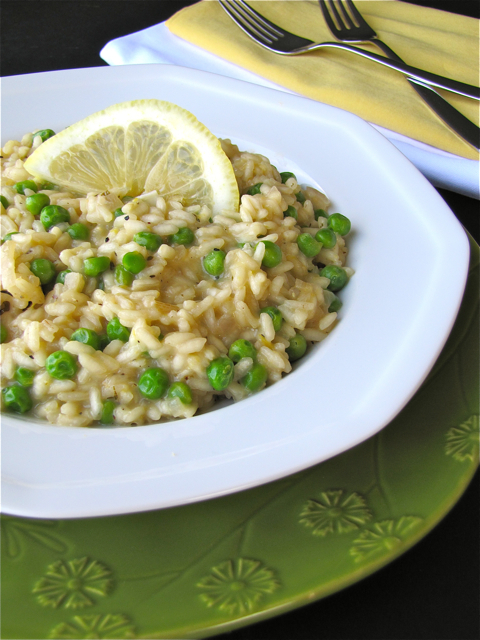 This Lemon Risotto with Peas has been in my recipe files for several years and it truly is perfect for, well Spring. 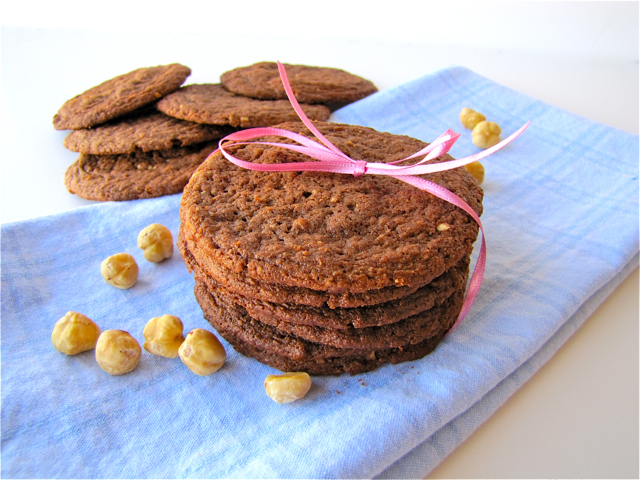 I found this recipe in a Light and Tasty Magazine and besides the fact that it is actually somewhat healthy, it also tastes great. If you've ever cooked a risotto, you know that they are not hard, but they do take a little bit time and quite some stirring. This risotto has a wonderful bright taste from additions of white wine, lemon juice and lemon zest, but also a creaminess that only a well cooked risotto produces, along with the sweetness of peas and the nuttiness of freshly grated Parmesan. I usually serve this risotto alongside grilled salmon, but chicken or even lamb are just as tasty. 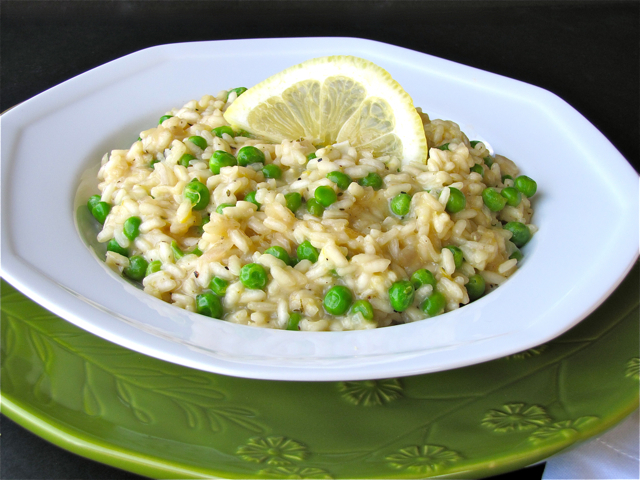 If you enjoy a good risotto with a nice lemony flavor this is definitely a great recipe to try. In a medium saucepan, heat broth and keep warm. In a large nonstick skilled, saute shallots in butter for 2-3 minutes or until tender. Add the rice, thyme and pepper; cook and stir for 2-3 minutes. Stir in wine and lemon juice. Cook and stir until all of the liquid is absorbed. Stir in heated broth, 1/2 cup at a time, stirring constantly. Allow liquid to absorb between additions. Cook just until risotto is creamy and rice is almost tender. Total cooking time is about 20 minutes. Add the peas, Parmesan cheese and lemon peel; cook and stir until heated through. Serve immediately. I love shopping at Trader Joe's and no, this is not a paid advertisement, it just happens to be one of my favorite grocery stores. It reminds me a lot of the stores I grew up with as a kid. Small, neighborhood stores with a fairly limited assortment of products, but yet everything available that you would need. Trader Joe's is like that. I could spend hours walking through that little store, checking out all of the cool and unique products they have. I always check out their flowers and more often than not, I end up with a bouquet in my basket to brighten up my day. Next up, I always have to stop at the cheese coolers, the glorious, amazingly stocked cheese coolers where I usually stand and have to check out all of the mouthwatering and at times, unique flavors. I also enjoy their wine selection and always seem to walk away with a new find. In fact, they do carry a lot of things that you just can't find at an ordinary grocery store and it is also the place where I buy my couscous among many other things. Israeli couscous that is, because my local supermarket likes to be difficult and won't stock it. 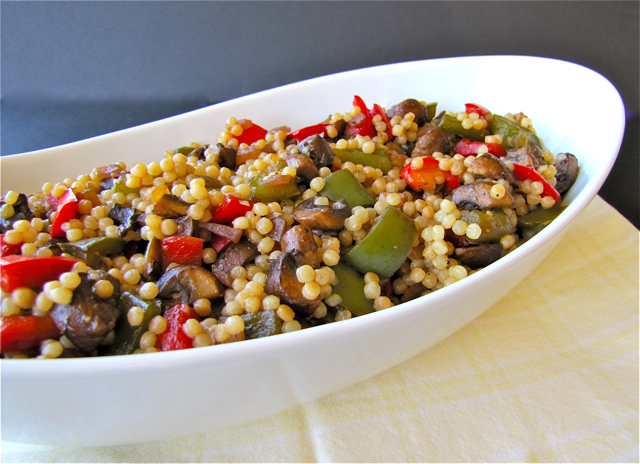 Israeli couscous is just one of those interesting foods, that put a little smile on my face every time I cook with it. I don't know exactly what it is about it, but I guess I enjoy that the texture is quite unique and unlike regular couscous. Many times I turn it into a salad or simply cook it in some chicken broth for a bit of added flavor. This time though, I wanted to incorporate a good amount of vegetables into the dish and not just any vegetables, but balsamic glazed ones. Red and green bell peppers along with onion and baby portobello mushrooms were my choice for this recipe. To make this a true vegetarian dish, I decided to cook the couscous in vegetable broth to infuse flavor throughout. While the couscous cooks, the cut up vegetables are simply sauteed in a bit of olive oil. They are seasoned with salt and pepper and a final touch of balsamic vinegar made these vegetables a standout. I also made sure to cook them "al dente" since I wanted to keep the integrity of the vegetables intact. Finally they are folded into the cooked couscous before serving. The end result was such an incredibly tasty dish, that goes well with so many things. Anything from chicken to fish would be wonderful alongside, but it can certainly stand on its own as well. I served this dish hot right out of the pan, but happened to try it once it had cooled down, and it was equally delicious at room temperature. This turned out so well, that my family has already requested this dish again and with it being chock-full of good for you ingredients, I certainly won't have a problem cooking this in the future. For the couscous: In a 2 quart saucepan, saute 1 1/3 cups Israeli couscous with 1 tablespoon olive oil over medium heat until couscous is lightly browned (about 5 minutes). Slowly add 1 3/4 cup hot vegetable broth and bring to a boil. Reduce heat to medium low and cover. Simmer for 12 minutes or until liquid is absorbed. For the balsamic vegetables: In a large pan, heat 2 tablespoons olive oil over medium heat. Add the onions, peppers and portobellos and saute until vegetables begin to soften. Season with salt, pepper and balsamic vinegar. Continue to cook until most of the moisture from the vegetables has evaporated and the balsamic has glazed them, making sure not to over-cook the vegetables. 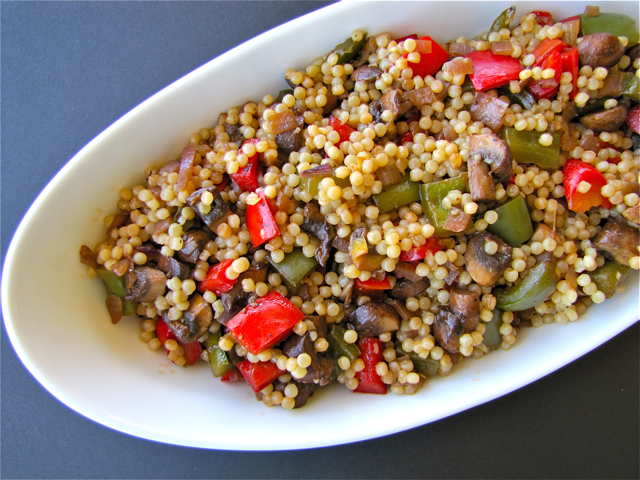 Fold the sauteed vegetables into the cooked couscous and serve immediately or at room temperature. Tomorrow I'm having a surgical procedure. Nothing huge, but I will receive general anesthesia and will most likely be quite uncomfortable for a few days. Stuff like this tends to give me a little bit of anxiety in the days leading up to it. To keep my mind of off things, I headed into the kitchen over the weekend to work on some recipes and posts so you guys would be well entertained during my "down time". Working in the kitchen, concentrating on a recipe, always has a calming effect on me and helps me to clear my head and this time was no different. First thing I made was this Blueberry Lemon Buttermilk Cake that I found once again on "Tasty Kitchen". It struck a chord with me right away for its flavor combination, but also for the simplicity of the recipe. Another bonus: getting rid of some of my very last frozen berries, which is perfect since fresh berry season is just around the corner. The cake is made quickly with just a few everyday items. 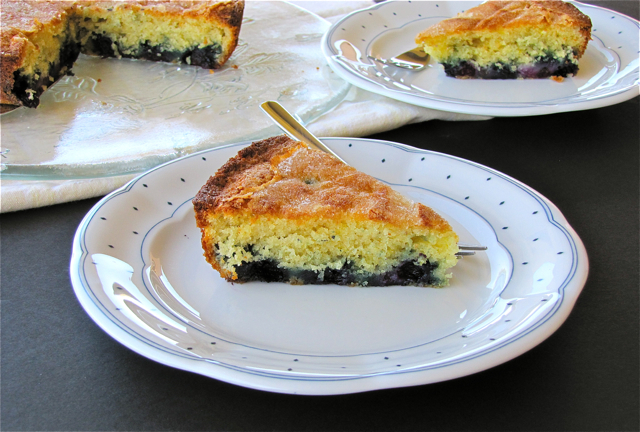 Once baked, it almost appears like the cake has layers because of the blueberries sinking to the bottom and the taste is very reminiscent of an old fashioned cake you would find in Grandma's kitchen. The cake crumb is just lightly sweetened with hints of lemon throughout, without the citrus flavor being too overpowering. The buttermilk ensures a light and fluffy texture and the juiciness of the berries works perfectly. To top it all off, the cake has a crunchy sweet crust from sprinkled on sugar which is added right before baking. The sugar crust also helps balance the sweetness level. This cake is simply wonderful for breakfast or even dessert, especially when enjoyed with a cup of coffee or tea. Since I made this on the weekend it was an amazing early morning treat that everyone in the family gave the thumbs up to. This recipe worked great with the frozen berries and there was minimal "bleeding"; however, I'm really looking forward to making it again when fresh berries are in season. 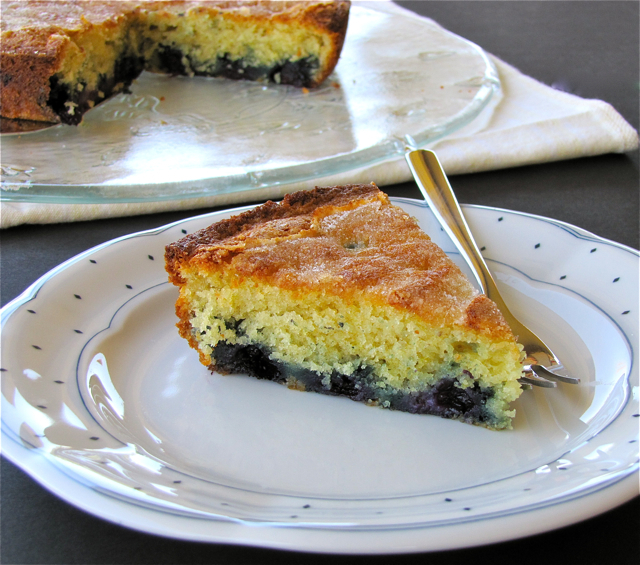 Blueberry Lemon Buttermilk Cake; it's a good thing! Preheat oven to 400 degrees F. Grease an 8-inch round cake pan and line bottom with parchment paper. Grease the parchment paper. Whisk together flour, baking powder, baking soda and salt; set aside. Beat butter and 2/3 cup sugar on medium-high until pale and fluffy, about 2-3 minutes. Add vanilla extract, lemon zest and lemon juice. Add the egg and beat well. At low speed, mix in flour mixture in three batches, alternating with the buttermilk in two batches, mixing until just combined. Carefully fold in berries. Pour batter into cake pan, spreading and smoothing the top. Sprinkle with 1 1/2 tablespoons sugar. Bake until cake is golden and a toothpick inserted into the center comes out clean, 25 to 35* minutes. Remove from oven and cool in the pan for 10 minutes then turn out onto a rack and cool for an additional 15 to 20 minutes. Invert onto a plate and cut into 8 slices. The time has come for another Progressive Party. Progressive Parties, in case you are wondering, are a wonderful way for bloggers to get involved with companies or sponsors to showcase their creative side in coming up with unique recipes. Six bloggers taking a stab at one ingredient in six different courses, sounds like fun, right? The parties are the brainchild of Casey and are hosted over at Kitchen Play where you can find all the info and can check out today's and previous parties. Many of you might remember my previous involvement last November when I created the "Bloody Olivia". Imagine my excitement when I was chosen again. 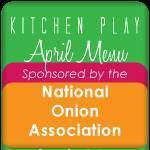 This month the "mystery" ingredient happens to be spring onions or sweet onions and is sponsored by the National Onion Association. When I first received the assignment and it said spring onions, I was actually a little puzzled and wasn't quite sure what they were. Thankfully with some research on the association's great website, I was ready to get in the kitchen and start creating. Spring onions are also called sweet onions and are typically available from March through August. They tend to have a much lighter, thinner papery skin and are sweeter than storage or fall onions. Their moisture content is also higher and with that, they are actually more susceptible to bruising. 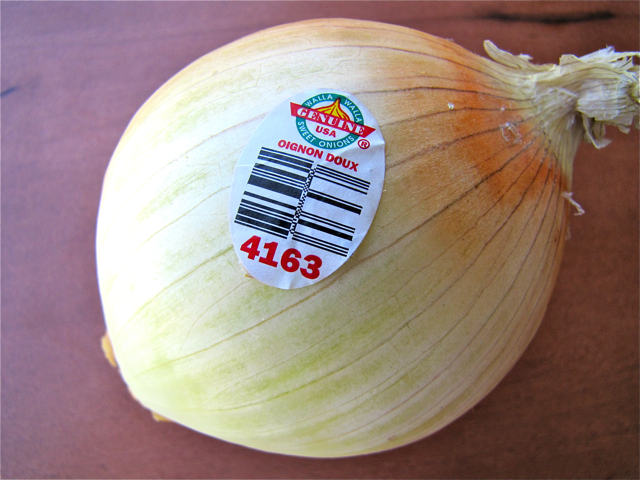 Some common trade-names that you all might be familiar with are Walla Walla Sweets, Maui Sweets and the ever popular Vidalia Onions just to name a few. For this progressive party I was assigned the appetizer course and decided to go with Walla Walla Sweets for my dish. I was still able to find them at my grocery store in the fall, which is when I was assigned with this party. Unfortunately this particular kind won't be available again until the June time frame, but there are many other options that will work just as well, like Vidalias. Just head on over to the National Onion Associations' website to see what's available. Coming up with a recipe wasn't quite as easy as one might think. I use onions on a daily basis in my cooking at home and we are typically a family of onion lovers. However, I wanted to make sure to create a dish that showcased the onions' sweet taste, but was also light and "spring like" tasting. My first instinct was to go with bruschetta which I love serving as an appetizer as you can really transform them to fit any season or occasion. I played around with a few different applications for the onions, but finally decided that making an onion jam would highlight this great ingredient best. 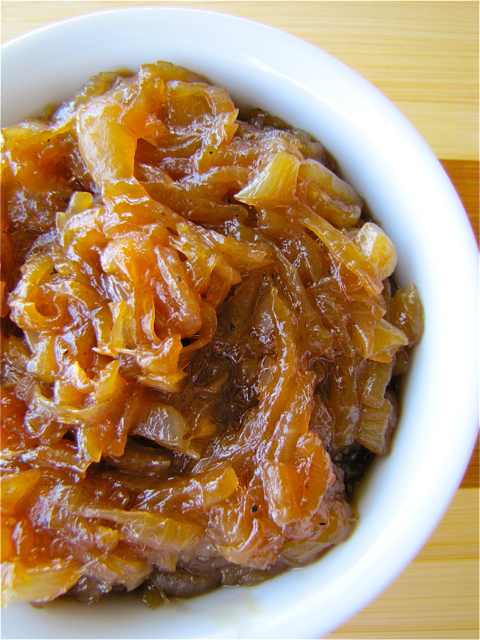 Typically, onion jam is made with dark balsamic vinegar, but in order to keep my jam light tasting, I decided to use white balsamic instead. That, along with light brown sugar and white wine, made for a great start. Some seasonings, fresh thyme and just a bit of apricot jam added the finishing touch. The onion jam turned out beautiful, with just the right amount of sweet to tart ratio. After taste testing several bruschetta combinations (I know, being a food blogger is rough), I decided to create a bruschetta that would satisfy all of my senses. I had in my mind that the bruschetta should be sweet, but also creamy, crunchy and salty. 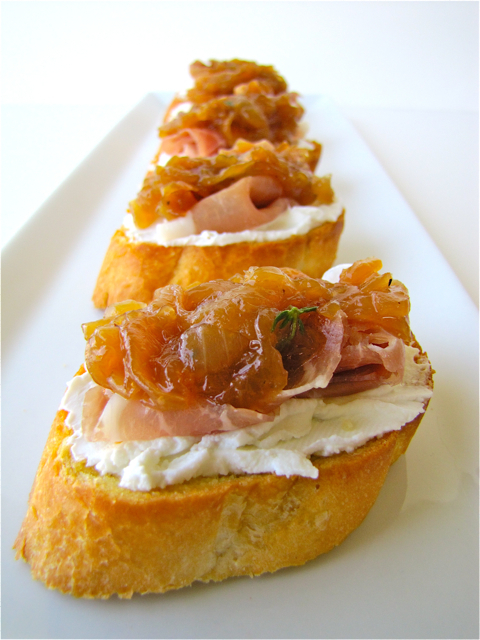 I found the latter three components by simply putting the onion jam together with crunchy, toasted baguette slices, creamy and slightly tart goat cheese and last but not least, salty slices of prosciutto. 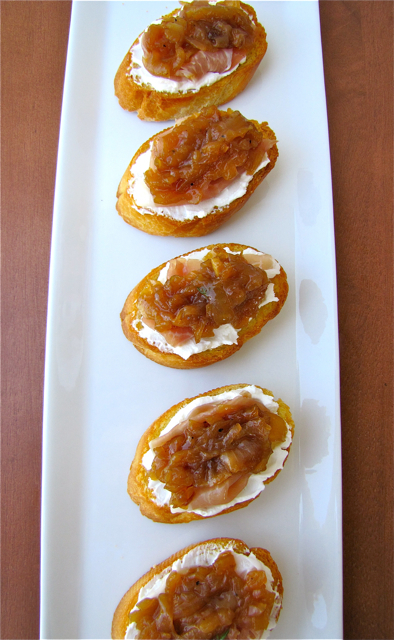 Topped with the spring onion jam, this appetizer turned out even better than I had dreamed. This is really an amazing appetizer and I'm incredibly proud of this creation. I've served this already several times to friends and the reaction is always overwhelmingly positive. On a side note, while the jam is spectacular in the showcased combination, it is also fantastic in many other applications. Think of it as a tasty condiment which can perk up a vast array of dishes. If at this point my recipe has made your mouth water, go ahead, make the spring onion jam bruschetta, blog about them and submit your link to Kitchen Play. By doing so, you will have a chance to win $100.You have until April 30th, 2011 to enter, so don't wait, I know all of you could use a little extra money with vacation time approaching! Preheat oven to 425 degrees F. Arrange bread slices on a rimmed baking sheet. Brush top of each with olive oil and roast bread until top is golden 10-12 minutes. Remove from oven and cool toasts on sheet. Spread 1 tablespoon goat cheese on each cooled toast. 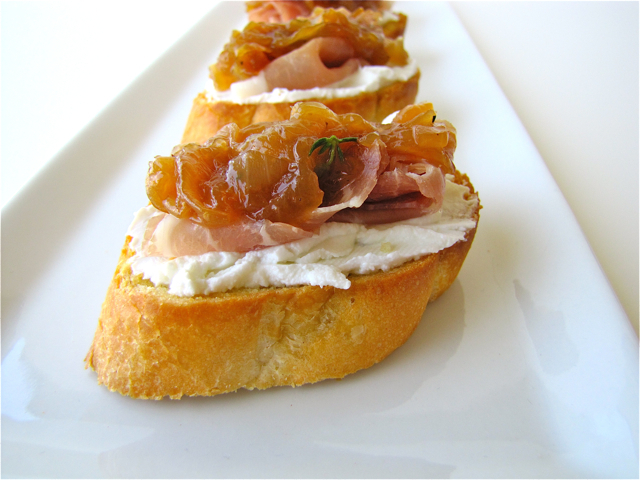 Arrange prosciutto halves on top of the goat cheese and top each toast with spring onion jam. Arrange on platter and serve. Melt butter and oil in a medium-sized skillet over medium heat. Add sliced onions and cook, stirring, until soft and translucent, about 10 minutes. Add the sugar, wine, balsamic vinegar, apricot jam, thyme and a pinch of salt and pepper. Cook over low heat, stirring, until the liquid thickens and coats the back of a spoon, about 35 minutes. Transfer the onion jam to a bowl and let cool. Serve at room temperature. We've had quite the eventful week. The kids are back in school after enjoying a two week long spring break. This is a big deal for two reasons, one, summer break is literally just around the corner two months from now, and secondly, this is my daughter's last quarter in High School. Ever. She is graduating in 9 short weeks and I'm not sure if I'm ready. I keep looking at pictures from when she was just a teeny one year old and keep thinking where did all the time go? We are also getting ready for prom, which is coming up this weekend and the following weekend (yes, she is going to two). We happened to find the perfect dress over break and this week it is just mayhem trying to pick everything up that still needs picking up, along with various other school functions. Dinners during weeks like this have to be quick and well planned out. While looking for inspiration in my magazines last weekend trying to come up with my weekly dinner menu, my eye caught a recipe for a Thai Curry. I found this recipe in my newest bon appétit magazine in their "weeknight cooking section". So far my experience with Thai food has been pretty much limited to eating it at a restaurant, but the recipe sounded easy enough that I was willing to give it a try. Halibut and Shrimp was the magazine's choice of fish in this dish, but after contemplating these ingredients and checking my freezer, I decided to switch it up slightly and go with big, juicy scallops and shrimp instead; and I'm so glad I did. I also ended up adding some extra chili garlic sauce and more curry paste for additional heat and flavor, increased the fish sauce and used light coconut milk since this is what I had on hand. My kids were all extremely leery when finding out what I was cooking, none of them trusted that this "strange" hodge podge of ingredients would come together. I guess it worked though, as proven by my empty pan. Every single one of them asked for seconds and the dish was incredibly tasty. 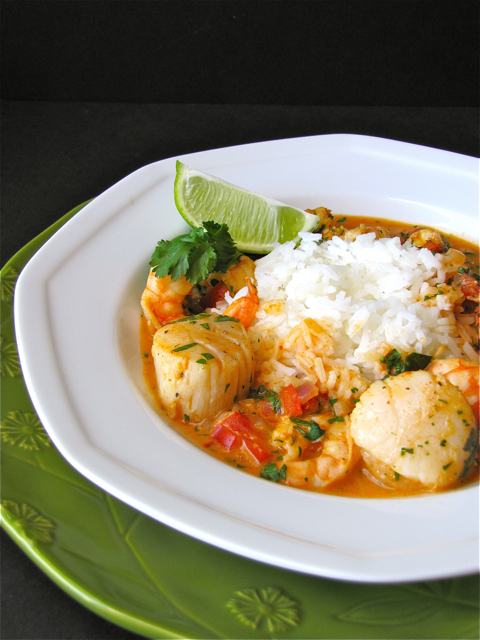 The flavors are wonderful and the shrimp and scallops worked beautifully together. I used pretty large scallops and shrimp, so cooking it at 5 to 6 minutes was spot on, the scallops were perfect with just the slightest bit of opaque inside and tender as can be. However, if you plan on making this and you use smaller shrimp or bay scallops, you will have to reduce the final cooking time to avoid turning them into rubber. This recipe was a great new discovery that has already been requested again and will be a great addition to my ever growing recipe collection. I really hope you consider giving this one a try! Finely grate enough peel from 2 limes to measure 1 1/2 teaspoons. Squeeze enough juice form 2 limes to measure 2 tablespoons. Cut third lime into wedges. Heat vegetable oil in large saucepan over medium-high heat. Add chopped shallots, diced red bell pepper, and minced ginger; saute until shallots are tender and pepper soften, about 5 minutes. Stir in curry paste, chili garlic sauce, coconut milk, fish sauce, 1 1/2 teaspoons lime peel, and 2 tablespoons lime juice. Simmer gently, stirring often, about 5 minutes. Sprinkle scallops and shrimp with salt and pepper. 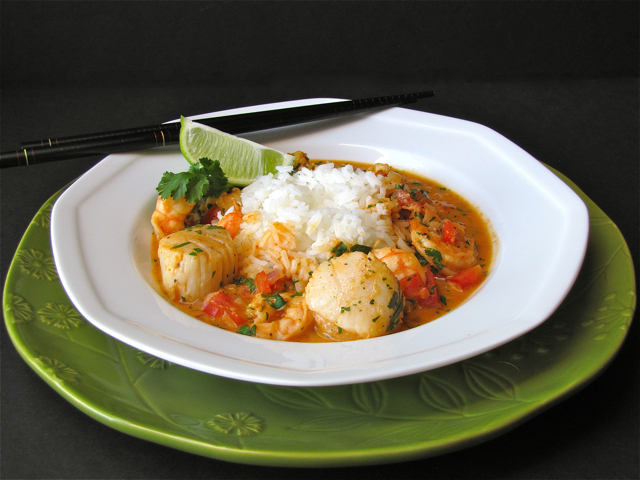 Add scallops and shrimp to curry sauce. Return to very gentle simmer and cook just until scallops and shrimp are opaque in center, 5 to 6 minutes. Season to taste with salt and pepper. Gently stir in cilantro and basil; serve with lime wedges.